seeds of future researches in the following. We recently applied the TDDFT to laser-assisted field evaporation of nanostructures to elucidate the microscopic mechanism of electronic excitations and ion detachment. We also develop the TDDFT program code to enable the longtime simulations of multi-component quantum dynamics. In this year, we discuss each other on the researches of each member and determine how to make our interdisciplinary researches possible. This division has been established on the April of 2015. Our aim is to make interdisciplinary researches between mathematical analysis, numerical analysis, physics, chemistry, biology and technology. 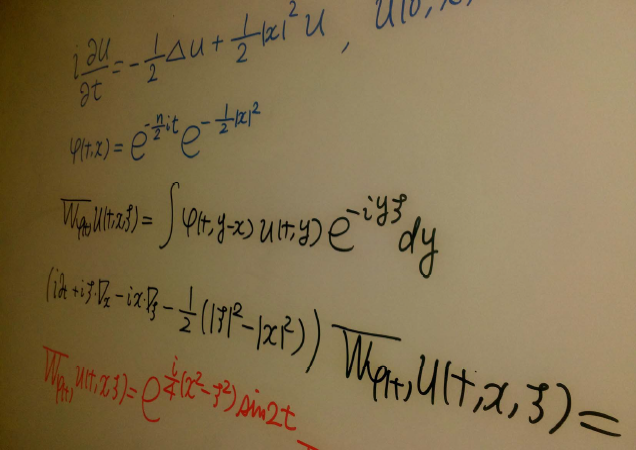 The members of our division are willing to cooperate to those who need to techniques of mathematical analysis or numerical analysis. Copyright©Tokyo University of Science, Research institute for Science and Technology. All Rights Reserved.